NBA Gossip: Does LeBron Have A Way “Out” Of Cleveland? Rajon Rondo led the Boston Celtics to a 2-2 tie in their 2nd Round series with LeBron’s Cavs. If the Cavs are so great, then why are they having a problem with a team filled with geezers? Every time I turn around, I hear about how the Cavs are the best team in the league — but now they are playing with fire against Boston. I think LeBron is looking for an out. He needs a reason to leave Cleveland so he doesn’t have to be the bad guy. Remember, his mother bought him a Hummer with a loan based on his earnings potential — while he was still in High School! Image is everything to this guy. I’m not one for starting rumors, but I believe I’ve figured out LeBron. He’s an egomaniac who wants everyone to like him. He craves attention, but lacks the killer instinct. He needs help but isn’t willing to acknowledge it. LeBron, I’ve got a therapy regimen for you before my discovery gets too far in the press. 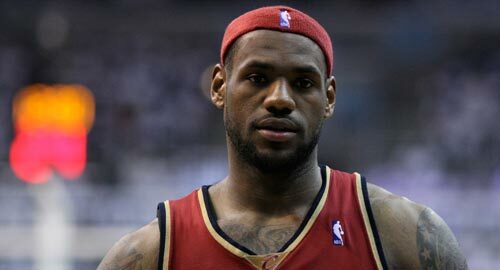 LeBron James is one of the most self-absorbed athletes I’ve ever seen. It’s not so much his play on the court — he has to play big because the rest of his team is average — as it is his antics before the game. I think what’s most disgusting about his behavior is that it’s completely disingenuous. He has no personality. We rail on Tiger Woods for being a “corporate creation,” but LeBron is no less “corporate” than Tiger. We can claim that Tiger’s marriage to Elin was a “corporate pairing,” but LeBron is no less contrived. Do you think HE came up with the “chalk throw?” Do you think HE decided to start screwing around during warm-ups? LeBron has a marketing team in place that is working his image constantly — remember the Hummer. He has to look good all the time. He has to be “cool” all the time. Not once has LeBron ever acted like a man when it counted. He doesn’t take warm-ups seriously — which is unprofessional. He wouldn’t shake D12’s hand after the East Finals in 2009 — which is unprofessional. He says the right things in interviews, but it all sounds scripted. I want to hear you come out and say, “My team sucked tonight,” or, “I was awful tonight,” not, “Rondo was great.” Notice how the attention was deflected in a bad situation. This is no different. LeBron wins for the Cavs, but never loses? Even Michael Jordan admitted that he was “trusted” with the game-winner 26 times and missed. Art Thou a “Big Baby”? LeBron is so absorbed in his image that he’ll never come out from under his own shadow. He’s outshone himself—badly. He created a behemoth. Combine that “behemoth” with his ego and you have someone who is chasing his own tail, chasing an impossible standard, and doing so without humility. He’s such a child, he cannot admit his own weaknesses. He hides behind everyone’s “6’8,” 280” overtures. He feeds on that adoration. Why does he do the “chalk throw”— because he needs to. He needs people to think he’s cool. He’s the dude who never went five seconds without a girlfriend — because he needed to be cool. He’s deathly afraid of failure. He’s deathly afraid of being imperfect. I want to say he sounds like a broken person, but it’s his own fault for not owning his imperfections. So, on the outside, it sounds like sportsmanship, but on the inside it’s avoidance. Yep, I said it. LeBron is a child trapped in a 6’8” 280 lb. frame. In my opinion, nobody truly respects LeBron. They all know the things I’ve said — deep, down inside — and are just afraid to admit it. The shame is, he’s an incredible player. I want to pull for him, but I can’t. LeBron is a baby. He’s unprofessional. He’s a great player, but he’s an ego-maniac. He’s been coddled his whole life. He’s a “corporate monster” just like Tiger. Be a man and stop hiding. Admit to us that you aren’t perfect. Admit that your team isn’t good enough and you need help. Admit that you’ll be done at 30, if you have to keep playing like this. Stop chasing your own tail. Stop trying to live up to your own stupid expectations. Just play basketball and let the chips fall where they may — then own where they fell because of your play. Sign an extension with Cleveland, right now. Don’t wait. Don’t hover. Don’t hold your future over the heads of the fans in Cleveland. Those people deserve better than that. Don’t negotiate. Take the max contract and be done with it. Do we really think stringing along long-suffering fans like folks in Cleveland is even remotely cool? If I were a Cavs fan, I’d be so pissed right now. If you’re staying—stay. If you’re going—tank it. The only thing worse than losing the Finals to the Lakers is winning it all and having LeBron leave. You might as well just stab everybody in Cleveland in the chest if you’re going to do that. You could easily say, “This team can’t get me enough players” and bolt. You haven’t addressed the situation, so I’m left to believe that you intend to leave. We can speculate all we want, but if he really wanted to commit to Cleveland—he would have already. The contract would have been signed in October or November. There’s too many ways for LeBron to leave and be the “discriminating athlete looking for a Championship.” I don’t buy that. You play for the love of the game or don’t play at all. You aren’t entitled to a championship. If you think you are—then move out of the way. How Long Do Steroids Stay In Your System? SteroidsLive provides expert tips and tricks of the trade by personal trainers and fitness experts that help keep you on top of current industry trends, as well as up-to-the-minute information on your favorite athletes, bodybuilders, coaches, and teams. The SteroidsLive blog covers the latest news in bodybuilding, fitness, sports, health and nutrition. We strive to give our readers — athletes, fitness and sports buffs, and those interested in all-around health — the latest news, information, and of course — the gossip. How Many Exercises and Sets Do I Perform for My Strength Training?